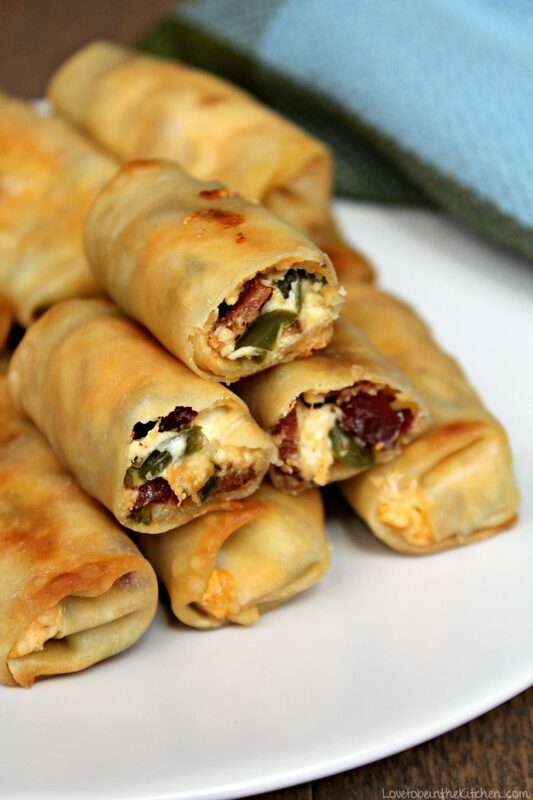 These Mini Jalapeno Popper Egg Rolls are the perfect crowd-pleasing appetizer! Creamy, crunchy, cheesy, spicy, and flavorful! Jalapeno Poppers are one of our favorite game day snacks. 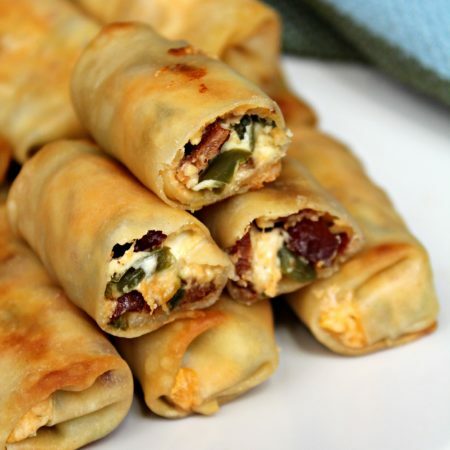 I love variations of the classic recipe like these Bacon Jalapeno Poppers or today’s recipe, Mini Jalapeno Popper Egg Rolls. Not only do these taste amazing they are mini! I’m slightly obsessed with all things mini! Plus when it’s game time, if you are anything like me, you want to try a little bit of everything on the snack table. 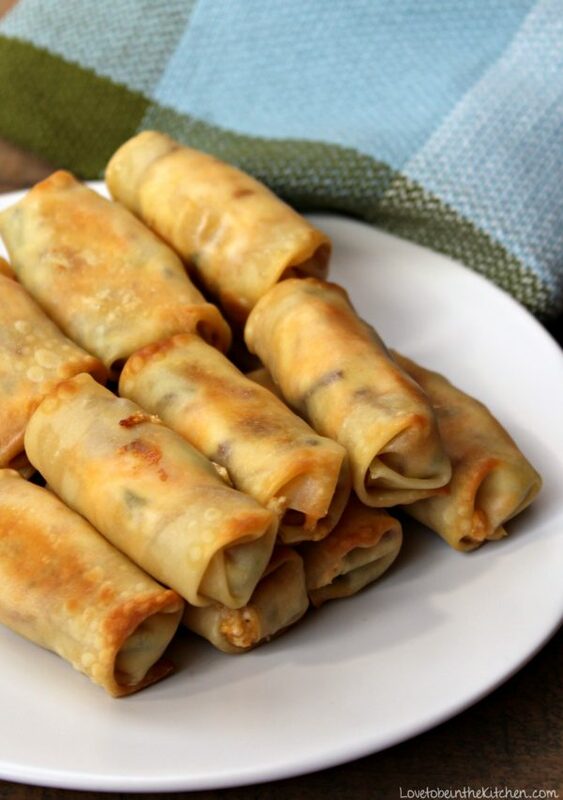 So these Mini Jalapeno Popper Egg Rolls are perfect. The delicious mixture consists of cream cheese, garlic powder, a dash of salt and pepper, shredded cheese, crumbled bacon, diced jalapenos, and green onions. Creamy, crunchy, cheesy, spicy, and flavorful! It’s the best! -You can make the mixture ahead of time, a day or two in advance. Just keep it stored in an airtight container in the fridge. -You can control the heat. Add as many jalapeno poppers as you want to get desired heat level. That’s why the recipe calls for 3-5. Plus jalapenos vary in size. -If kids or people who can’t handle spice are eating these you can boil the jalapenos to make it less spicy. (Just add jalapenos to boiling water and boil for 3-5 minutes.) Or you could even just use a green pepper instead. -You can bake or fry the egg rolls. I’ve included instructions on how to do either method. Plus my awesome tip on getting baked egg rolls super crispy! -You’ll use wonton wrappers for these since they are mini. You can usually find those at your grocery store by the produce. Often by the tofu. -Everyone will love these! It’s such a fun and tasty appetizer. 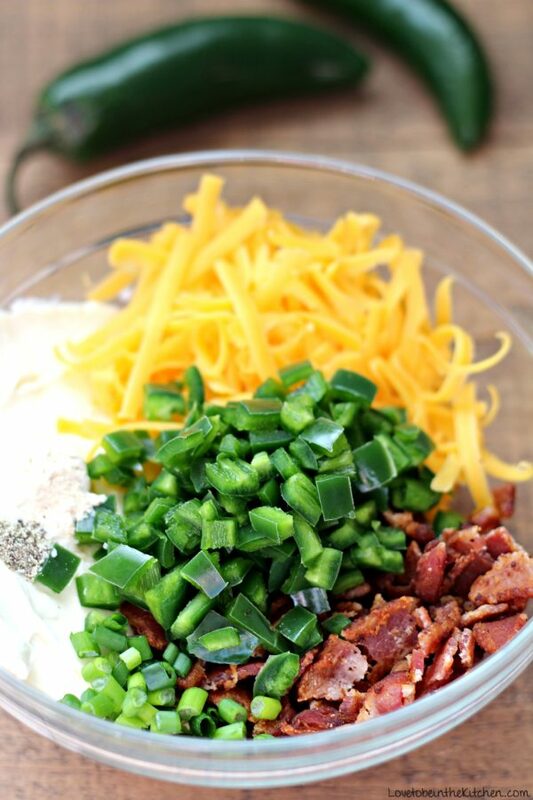 Mix together the cream cheese, cheddar cheese, bacon, jalapenos, green onions and garlic powder until well combined. Add salt and pepper to taste. Place wonton wrapper with the point towards you. Add 1 tablespoon filling on the bottom one-third of the wrapper. Brush a little water on the edge of the wrapper. (You can use your finger.) Fold the sides in and roll up making sure it is completely sealed. Repeat with remaining wrappers and filling. TO BAKE: Preheat oven to 425 degrees F. Spray a baking sheet with cooking spray. 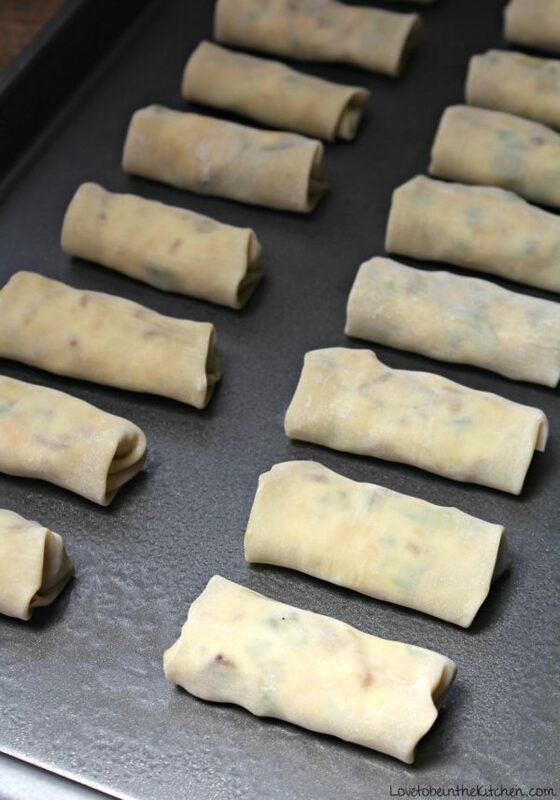 Line egg rolls on the baking sheet with the seam down. Either spray with cooking spray or for extra crispy baked egg rolls, in a small bowl melt 2 tablespoons of butter and add 2 tablespoons of vegetable oil. Stir. Brush some of the butter-oil mixture on top of egg rolls. Bake for 5 minutes. Flip them and brush with more of the butter-oil mixture and bake for another 4-5 minutes. Or until golden brown on both sides. TO FRY: Heat oil (350 degrees F) in a Dutch oven/deep stock pot, or deep-fat fryer, and deep fry egg rolls for 3-4 minutes, until golden brown. Turning as needed. Remove to a paper towel-lined plate, and allow to cool slightly before serving.